Flybe has announced it will be flying to seven new destinations from Birmingham Airport. Florence, Cologne, Toulouse, Alicante, Bordeaux, Palma Mallorca and Porto are all now closer thanks to the deal. It made me remember an eventful weekend in Porto. IT is midnight and I'm surrounded by 100,000 Portuguese party animals all armed with plastic hammers. And it is only the sounds and smells of the biggest firework display I've ever seen convinces me I am not in the middle of a surreal dream. When the final firework explodes into the night sky and the giant bridge before me is illuminated in the colour of Portuguese flag it is the signal for the fun to begin. There is first a tap, then a bang, many whooshes and a few almighty cracks and as I'm carried along with the crowd it seems every man, woman and child takes a pop at my sunburnt head with their plastic hammers. Then smash! Out of nowhere a giant vegetable smashes into my face wielded by a sweet girl with smug grin and slightly buck teeth. "Thank you," I say spitting seeds out of my mouth and tap her on the head with my plastic mallet. Judging by their football team I was expecting lots of rolling around and calls for me to be sent back to the hotel when I started to wield my hammer but everyone took it in wonderful humour as I practised Matrix-like moves to hit my targets. As Sao Joao is traditionally the festival of the lovers, no one I spoke to knew where the vegetable tradition comes from, I thought I'd better learn the lingo. So every time I got hit over the head by a woman I'd say in Portuguese: "Thank you so much for hitting me over the head with a hammer, you are a beautiful princess," all in the name of closer EU harmony of course. The responses were varied but as I couldn't understand a word they said it didn't really matter. For hundreds of years the Portuguese have assaulted each other with vegetables for the Festival of Sao Joao but in the last few years the plastic hammer brigade have become en vogue which is good news for hay fever sufferers. The Sao Joao Festival, which is at the start of June, is the official festival of the city of Porto, the citizens took a vote on it in the 1930s, and it is the weekend when the city stops to celebrate St John. Porto is the workhorse of the country and the saying goes as Porto works, Lisbon plays. But for two days a year the whole place stops for the Sao Joao festival and it is an incredible experience that matches anything I've seen in my life. The city's historic winding cobbled streets unlock another world of barb-e-cued sardines, strange smells and fun loving locals. Designated a World Heritage Site the old town is a fantastic glimpse in to an age gone by. Due to the country's close relationship with Brazil there is usually a smattering of the world's most beautiful women partying away at most Portuguese festivals which is worth the air fare alone. Northern Portugal has many delights, beautiful scenery and a very proud history among them, but it often loses out to the Algarve in the tourist stakes due to the Southern destination's better weather. However, the North has a certain elegance that the Algarve lacks and among its rolling hills and beautiful valleys there are some hidden treasures. Portugal's own brand of Catholicism makes visiting churches a captivating but often macabre experience. The tradition to have life size statues of several saints, depicting their usually violent death, can be a shock to the system but places like the Bom Jesus do Monte and the Verde de Honra churches are breathtakingly beautiful despite being a touch weird. The place that contains the birthplace of the first King of Portugal is a must see. The city of Braga is a spiritual home for millions of Portuguese and to see where this remarkable country, Britain's oldest ally, was formed in the 14th century is fascinating and beautiful with the thrown in attraction of one of the most stunning football stadiums in Portugal. One great aspect of visiting Portugal is the price of everything, after all a holiday is always nicer when everything's cheaper than back home. Eating out is very cheap and the bottles of Portugal's national drink, Port, are surprisingly affordable and a tour around one of many port distilleries should be a definite on anyone's tourist to do list. But the best piece of advice of I can give any visitor to Portugal is to check when there is a festival near where your staying and book up for then. 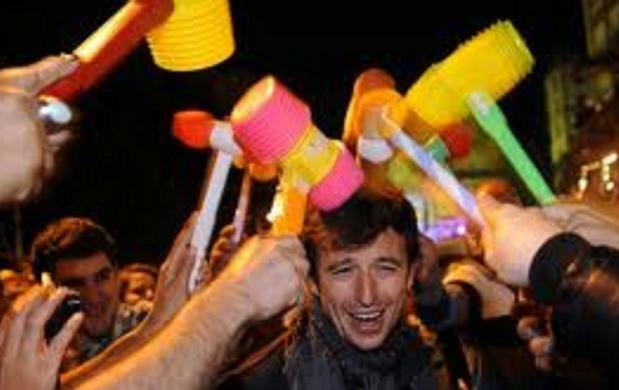 Because Portugal has more festivals than you can shake a plastic hammer at and they usually prove a big hit with everyone!